You will have to take my word for it that even before Steven Joyce said as much, I was already thinking of summarising the Government's Tax Working Group as something set up principally, if not entirely, to validate imposition of Capital Gains Tax. Also, the appointment of Michael Cullen as chair will inevitably see the Working Group decried as not truly independent. And that's really to take nothing away from Sir Michael who has proven himself as a talented and innovative thinker - both in Government and working alongside the National Government - notably as chairman of NZ Post. It's just that he won't be SEEN as independent, no matter how it's spun. This country could do with having a good 'root and branch' look at the whole tax system. I've long railed that taxation (and this is by no means exclusive to New Zealand) is seen and implemented by governments as a 'blunt instrument'. Willing worker is cracked over the back of the head and money is removed from his or her wallet. In a word: unsubtle. 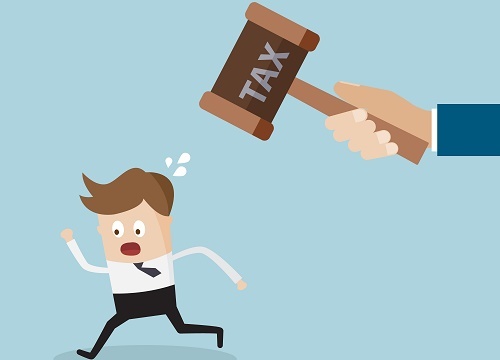 Insufficient efforts are made to use the tax system in a kind of carrot and stick way - to encourage people to behave in a way that is seen as virtuous for the economy, perhaps by offering incentives of both a positive and negative nature within the tax system. The essential problem is that previous governments have lacked either the will or the spine to implement, en-masse, recommendations from previous tax working groups. We know Labour has wanted to introduce Capital Gains Tax and so the suspicion, largely confirmed by the working group announcement, was always that whatever the working group came up with, the key thing to come out of it would be a CGT. By keeping the brief for the working group as disappointingly narrow as it appears to be, the Government is effectively merely only asking the question: GGT - yes or no, and how do we apply it? I do wonder if the short duration of New Zealand's electoral cycle isn't at least partly to blame here. Three years is not long enough and we should give serious consideration to lengthening it to four or even five. What we get with three years is governments in one of two styles; either they come out of the traps like a greyhound with its backside on fire and attempt to do everything in the first year, so, that things are bedded in well ahead of the next election and hopefully have gone well enough to get that government re-elected, or they sit tight, make incremental changes, balance the books, follow polling religiously, and tweak policy settings whenever something emerges as a public issue/problem. You might have already recognised from those two descriptions that we've just had nine years of the latter type of government, while this government's already looking like the former. It is interesting to look at the timeframe for this working group. It won't meet until February. Then it has just 12 months to come up with recommendations and put them to the government. That's not very long and pretty much ensures, I would have thought, that the group won't get much past deciding yay or nay on CGT. Why does the Government need the recommendations by February 2019, when the next election is not due till the latter part of 2020 and Labour's already promised the recommendations would not be implemented before the next election? Is the Government yet harbouring some thoughts of slipping CGT in before the election? Surely not. That would appear to be suicide. More likely the Government just wants the electorate to get 'used to' the idea before the crosses next go on the ballot papers. I suppose in a fairly cynical way that does make sense. But it is a shame, if such is the thinking, that governments here have to go to such elaborate lengths to implement a policy that is seen by a government as desirable. Things like tax and superannuation are used so regularly as political footballs - and again our shortness of electoral cycle doesn't help - that it makes the political parties very leery of changing things. And that is a shame. I've said previously that I am in principle in favour of some form of CGT. I like the idea of it because I would like as much as possible to see a 'level playing field' across the various asset classes for investment purposes. But, it's not sensible to inject a CGT into the mix without looking at the whole system and where other tweaks might need making. And I find it difficult to believe that this working group with its narrow terms of reference and short, short timeframe, will do that. So, again, the concern is that the CGT may be applied as a 'blunt instrument'. But of course, before we get there we have the small matter of another election. And presumably anything this government recommends in the way of a CGT will be strongly campaigned against by National next time around. The possibility then is that the whole issue of CGT just keeps getting bounced around (as it has for many years now) and, along with other possibly virtuous changes to the tax system never quite happens. Possibly to the country's detriment. What about consensus? Would there ever be some chance of getting cross-party agreement to another comprehensive working group looking at the whole tax system and with the political parties agreeing to implement the findings? In the meantime we've got our working group on tax that's really just there to convince the electorate that a CGT won't kill everybody. Maybe that will work. And as I say, maybe the group might surprise us and throw up a few other ideas too. This would be welcome, but I'm certainly not counting on it. Consultants are mystical creatures, whom you summon, hint at the answers you want, and then wait a period of months for them to present those answers back to you. Cullen is Grant Robertson's mentor, the result and recommendations are already determined, otherwise they would have chosen independent experts rather than party insiders. This whole horse and pony show is just spin. Thats one sort of consultant, the other sort I have seen is the high priced consultants that repeat to management (in slightly more flowery language) the same thing the guys on the floor said 6 months ago, but the $400/hr consultant is hailed as a visionary while the $40/hr guy in overalls is ignored. Michael Cullen is a man of great integrity who has served New Zealand faithfully and well, he was even used by your much adored National Party because they considered him so talented and impartial. Your comments Foyle, are either self serving, or just plain ignorant,,. The bullying continues as the Landlord who provides accommodation to their community gets punished again and gives up under duress creating a Rental shortage Crisis! The Landlord has never had control over house prices but is made a scapegoat for political persuasion and TAX revenue for the new Government. Yeah, OK Robert, keep running that line - Landlords are New Zealand's modern day Mother Theresas. The illustration of the Landlord running from the Large hammer over his head is real and bullying by the Government is ongoing. A Landlord is not a flipper of property and is only trying to provide accommodation to families in their community. The flippers will be paying tax with the two year CGT already in place! Leave Landlords to provide for their community and stop bullying them! They are there to make money like everyone else Robert. Helping others would be the furtherest thing from their minds. The problem is that some of them and mostly boomers have made a pig of themselves in the number they rent from the Bank and this is one of the reasons why they are now so expensive especially in Auckland. I did not vote for Labour but I can see they are going to make the playing field a lot more even for FHBers for a start. You are not serious with your comment . Joking right!!! A landlord is a weasel who goes out of their way to avoid making improvements to their property as they have little empathy for the families in their community who are nothing more than potential income to them. Landlords are one of the very few service providers that will gladly look down on their customers and tell them they should appreciate the generous service they provide. I suppose if there were a shortage of tenants then things might be a little different. Rental shortage crisis.. you make me laugh. The house won't suddenly disappear, it'll still be there, and unless somebody wants to be paying rates and maintenance on an empty house there will be someone living in it.. so its a net zero sum game whether the landlord owns it or sells it. Why then are landlords not madly building more accomodation, you know, competing for business? In other areas manufacturers are constantly working on delivering better, more affordable products. You assume all landlords know what they are doing. They don't. Some just followed what their peers did during a time of opportunity. Some of them call that working hard. No, actually I assume there must be some fundamental institutional settings which prevent normal competitive behaviour. National seized upon planning restrictions as "the cause" and Labour deep down inside belief that landlords are the enemy and they should all be packed off to the salt mines or shot, but will settle for stealing from them via CGT as a second best. Sigh, most of the so called "capital gains" are just the result of the ongoing destruction of the purchasing power of currency on a worldwide basis. The planning restrictions are indeed silly and counterproductive, but more so is bringing in lots of people from overseas when we can't even build weathertight houses for ourselves. Why do people delight in applying "solutions" that have been tried elsewhere and failed? I posit those on the Left believe that to about the same extent those on the Right believe the best (final) solution is putting people in gas ovens to improve society. Ok, so I got a little carried away there, but Cullen's "rich pricks" comments do suggest something of the sort. Because they thrive on scarcity, as long as they can stop everyone else from building or making accommodation available in their area, they don't need to spend a penny and their rental will remain scarce. There's minimal incentive to develop land or sell it to someone who will. Rental Shortage is dire in Wellington and Auckland since October last year after the 40% LVR regime. The Rental Shortage is the worse Trademe has ever seen! "The Rental Shortage is the worse Trademe has ever seen .' are they lines taken from your upcoming pantomine. @Pragmatist Persons per house are higher in rentals. Its actually true that as rentals are converted to homes that you get a shortage. You mistake correlation with causation. Young people are generally renters and more likely to live in large groups, but a typical mid thirties family of four is still a family of four whether they own or rent. Ted Stanton, you need to calm down. The TWG will conclude that moving to a CGT is desirable and that CGT, like GST, works best when it is comprehensive without any exemptions. "Broad-base low-rate option is generally a sound principle to adopt" - Question is will Labour's initiatives be consistent with this principle and be revenue neutral or will the TWG be, as many suspect, a guise to increase the tax base to pay for their spending promises? They just don't like people being independent, they want everyone to be like dependent teenagers, following their "advice". They forget that teenagers can see that "advice" as thinly veiled threats and want independence above all else. There is much that could be done to improve the tax system, but so far it is an inauspicious start. I still cannot understand why intelligent people think CGT is a good thing, it just encourages governments to stoke the system to create capital gains. We do that too much already. Then, when the government really needs the income it disappears completely. I think the current word is "procyclical" but runaway feedback seems more accurate. California and Ireland both had CGT and it only encourages more silliness. The bigger danger is a CGT that does not subtract inflation. Providing an incentive for Govt to run high inflation. This is an existing problem for other investments too, should only pay tax on investment gains above inflation. Not mention that to be fair losses should be refunded in cash to the same degree as profits are taxed. I'm all for a fair and simple system, but CGT is just not the way forward. CGT also needs adjusting for loss of value due to government ineptitude. For instance, the government brings in a few thousand planeloads of people and the value of my house goes up, but the enjoyment of it goes down because my 5 minute drive to the beach now takes half an hour. Also, the number of rules and regulations explodes as the government needs an army of bureaucrats to draft rules about things that just were never a problem before. Is that why the bureaucrats and government employees want more immigration? Cullen has already shown his CGT ideological hand with his FIF capital gains based tax on foreign shares. There is no doubt about where this comrade will direct the 'working group'. But FIF was an easy 'rick pricks ' target. It'd be politically difficult to hit mum and dad owned NZ shares the same way as most either already yield above or close to the FIF threshold of 5% or are companies in their capital hungry development phase and diminishing their attraction to investors, relative to offshore shares, would be dumb. Why would you keep much money in the NZX without the tax advantage? CGT on assets excluding the 'family' home (buy a bigger mansion) but not complemented by an inheritance tax, means estate planning careers will experience a renaissance. Valuing small to medium companies is highly subjective, with large variations in opinions the norm. Imagine the court cases. Estate taxes are a waste of time (though as an egalitarian I am in favour), as with a long term view they can almost always be avoided - just with a lot of incurred costs and inefficiencies that do nothing useful for the country. They also have potential for chasing wealthy families off shore to more tax efficient jurisdictions, which is bad for NZ economy - rich skilled people are teh ones who create enterprise level businesses. The FIF scheme is based on a fundamental misunderstanding of capital flows anyway. NZ, for all it's weaknesses, is a first world country and as such does not have a shortage of capital except in times of crisis. If we all invested more of our savings offshore we sell NZD to buy foreign currency which brings down the exchange rate and makes our NZ businesses more profitable. This is what the NZ super fund does. Somehow Comrade Cullen thinks this is a Good Thing, whereas people doing the same themselves is Bad. Collectivisation in disguise. a) You are mixing up 2 distinct groups into one and that I think is in-correct. My view is "just" wealthy families are parasitic on NZ's economy and so not only is their leaving no loss I think its a gain for the rest of NZ. The other group are skilled people and they do benefit NZ IMHO. b) Estate (death) taxes are not a waste of time, by and large they help correct in-equality, see "wealthy families" above. Talent is correlated with wealth. Some wealthy people are parasites but i doubt most. Whats parasitic is the tax system the allows wealth accrue with unnatural haste. Regressive structures like GST, rates and no meaningful way to tax capital allow wealth building to cycle much too quickly. We dont want to chase the talented and successful away but they shouldn't be able to avoid paying a fair tax. You dont need an estate tax if you are taxing income and capital appropriately. Estate tax is ridiculous philosophically anyway and is little more than a band-aid solution. My thoughts exactly, David. One of the only ways to improve our governance prospects is that 4-5 year term. And given we are an MMP environment characterised by coalition governments - there is little downside risk associated with that longer term. In other words, coalitions need to work on a consensus basis, and hence we wouldn't need to worry so much about a single party executive running amuck over a five year period. DH - you should consider GST in the mix as well. Whiskey must qualify as a a basic and staple food for at least one member of our new govt. In New Zealand Bullying is a big problem. As I see it the people that have been bullied the most in New Zealand are Landlords. Just read the Herald and listen to Labour when in opposition and now the gang in power! The other people that have been bullied are the Chinese people who work hard to buy a house and have contributed as our major export earner to New Zealand. Robert Redford, I gather by your continued moaning youvé yet to find a superior habitat than God's own. Your repeated comments on this subject appear as a cry for help that Landlords like yourself that profes about providing a "superior public service" are at risk of being bullied out of existence. If you believe that strongly that the Landlord (as we know it) is at risk of extinction and need special protection then contact David Attenborough. Why are you always singling out Chinese when we are also a great home to many other nationalities! Most will agree immigration in moderation is a good thing and besides, isn't this why we have the Human Rights Commission - to protect everyone? If you put this into perspective, I believe we have far superior human rights record than Homeland China. Think about it. Farmers and builders cop their fair share of bullying too! It's a new trending national obsession. The Taxpayer is getting thousands of private Landlord houses for FREE including all costs and maintenance for FREE so why do they want to Tax and make it harder for Landlords? Wow, even more one-eyed than a Hurricanes rugby supporter. If its so hard.. quit, sell up, let someone buy your properties for themselves to live in. Property investors are being subsidised via welfare. Examples include the Accommodation Supplement that raises the rent floor (a rising tide lifts all boats) and improves yields, and the First Home Buyers grant that is capitalised into prices (raising property values). In addition, rents and company wage bills are being further subsidised via Working for Families. Property investors and wage payers are simply receiving too much welfare that is not on the basis of need. Well stop taking taxes then as that way there is no money for manipulating pricing and or stock levels by politicians, bureaucrats and public servants! Simple really! @Rick Strauss Yup labor is well known to stealth support land lords and my guess is they will do so again. I want to sign up for one of your houses, my Landlord insists on charging rent to cover their costs and maintenance. As do I on my rental property. Are you sure you've got your business model nailed down? I'd rather they dump all taxes! Taxation is filthy dirty business which does nothing more than provide politicians, bureaucrats and public servants with nice shoes, clothes, overseas holidays, houses, food and every other bit of their daily expenditure. People complain they cannot afford a house yet do they ever look at the lifestyle of those above? Yes a small amount trickles back down but it is far less than what was taken in the first place. It is mathematically illiterate people such as those who who are advocating a CGT will solve the housing afforability problems that need to be ferreted out and pulled up.....or perhaps they are just plain old telling porkies which means they have a hidden motive. So are we going to go onto a charge everything as you go model if we drop all tax? Like see the cops pay before you speak your case or need the fire brigade but make sure you got cash or they won't put out the fire burning you house down. Am very curious to know how to fund these services fairly without taxes? But won't that just mean people will change how they store their wealth to again pay as little tax as possible? Eg. If someone lives in a house own by his parents while not holding his saving in a bank will get away from taxation. How the US looked in 1913 pre income tax and resultant gravy trains. "Individual federal income tax rates started at 1% in 1913, and the maximum marginal income tax rate was only 7% on incomes above $500,000 (more than $12 million in today’s dollars). 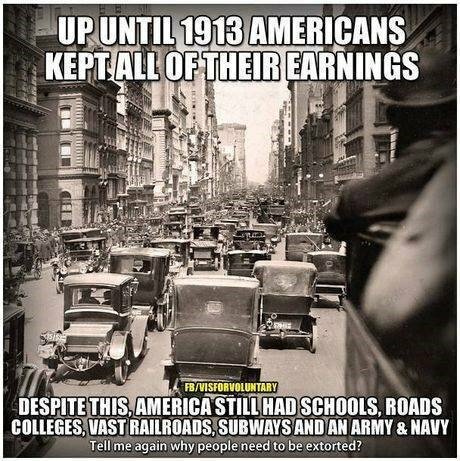 The personal exemption in 1913 was $3,000 for individuals ($72,850 in today’s dollars) and $4,000 for married couples ($97,000 in today’s dollars), meaning that very few Americans had to pay federal income tax since the average income in 1913 was only about $750." Landlords are bearing all the costs including the mortgage, damage all of the maintenance for FREE to the Tax Payer of New Zealand so that they do not have to fork out Billions of dollars for Tenant Housing. How can you justify taxing Landlords which provide FREE housing to Taxpayers? WE don't want to ba a nation of renters, so buckle up. Here's the thing - investing in housing has got so out of hand it's affected house prices, home ownership, and productivity through misplaced capital. The Government is taking long overdue steps to redress the balance. Whether it's unfair or not, the house party has gone on too long, it is up to you whether you stay till the end and risk the hangover or duck out early. I'm a taxpayer - where do I get my free house from? Robert Redford, you are wasting your time saying anything on this site. Most are lefties that think the country owes them a living and just moan about everything and are jealous of anyone that has more than what they have! You at least have your eyes open. Of course professional landlords are doing a great thing by providing accommodation to those that don’t own their own property. Without them we will end up with the state looking crap homes and we don’t want to go there. As for mai tenancy on property it is ongoing if you want to have your investments go up in value. Yes I know Gordon they are dropping in value in Chch! THE MAN 2, one positive thing that will emerge from the coming WOF shakeout - real professional Landlords. It's something we can all look forward too. And no, I'm not Gordon. Life is still good as a renter in Chch - just signed up for a new place for $515, was advertised at $545 and previously rented at $575. Nice for you to acknowledge they are dropping The Boy. If this labour government didn't like Nationals hiking of GST and lowering of income taxes, why doesn't it lower gst and raise income taxes? They can do this quite easily and quickly. These are not new taxes. They have already taken away your tax indexation "cut" and so in fact put up income taxes. No one was talking about Landlords until Robert Redford brought it up to have a whine. Agree the tax group mandate is disappointing, but here's hoping some decent recommendations to shift taxation from income onto assets are forthcoming. Differing view points which is good to have a balance. The Taxpayer has not paid for thousands rental properties that they may do in the future if private Landlords get pushed out. Well this is proving a most encouraging discussion – it would seem that any continuation of a softening in residential pricing is nigh on impossible. Any day now I expect hundreds, if not thousands of current or future landlords to descend upon the market and buy all they can in a desperate bid to ensure all citizens can enjoy a well maintained, safe and comfortable place to call home. We are indeed most fortunate for these kind and altruistic souls – for who knows what evils the market could deliver without them. hey,hey, just a minute. They need their equally altruistic bank to stump up 60%. The banks had better realise their obligations to help these poor souls achieve their combined societal good. Poor landlord RR. Here is one for him to consider as he would like a "balanced " tax system I am sure. Just let owner occupiers deduct a portion of their mortgage interest for tax. Allow landlords the same deduction. The exact amount should be determined by the IRD need to collect the same aggregate tax $ as now. Of course for a mortgage free landlord there would be no effect. Wonderful, eh?